Our newest Eco Cool family of heat exchangers delivers highly efficient and eco-friendly solutions for industries such as food & beverage, waste water and automation. The sleek design provides an efficient exchange of heat, resulting in a cooler, sustainable enclosure environment. Heat inside the enclosure is circulated through internal fins by a fan. The increase in fin temperature causes the heat transfer from the internal to the external fins. 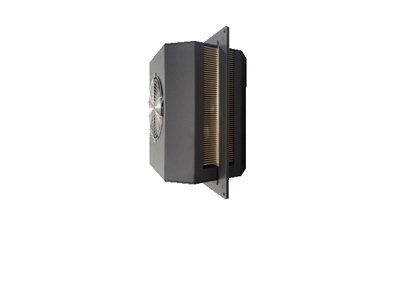 A fan circulates cooler ambient air around external fins to dissipate the heat. The enclosure is sealed and there is no exchange of air with the exterior or outside air. The heat exchangers utilise a high-efficiency heat sink profile, as well as ingress protection that meets NEMA 12, 4 and 4x standards (and IP’s equivalent), pending UL Certification. The units are sealed with high-quality gaskets to prevent the exchange of air from in the enclosure with the ambient air outside of it. The units can also be mounted in any orientation, allowing for optimal efficiency regardless of the specific application.